The other week at uni, instead of a tutorial, we were asked to make our way to one of a list of places in the city and make some observations. With the brief ‘cities at night’, we were to produce two 150 word pieces — the first a description of the place, the second a description of a person within that place. I chose the supermarket at Broadway. I chose it because I’m writing about supermarkets for one of my feature articles, and because I really dislike the place. Actually, most supermarkets make me vaguely anxious. And that fascinates me. What is it about them that makes me anxious? My written pieces for this exercise don’t really attempt to address this question, but I thought I’d share them here. On the whole, it is a place devoid of smell. Only the bread and meat sections have a scent: both vaguely sugary. There are few Supermarket Rushers at this hour. People move in a dream-like state, eyes sliding over the shelves, occasionally stopping to peer more closely. To speak to someone is to wake them. Away from the hum of the fruit and vegetable section, people’s footsteps can be heard on the bright white hospital floors. The high heels and heavy business shoes have gone for the day, left are those who have had time to slip their feet into something more comfortable. White light — a Hollywood yellow in the cosmetics section — shines down from above. This place seems both small and enormous; with no windows there are no landmarks for perspective. Phone between her shoulder and ear, basket dangling from her arm, she puts two heads of broccoli into her basket. Her grey sneakers take a few steps away. She is not speaking English on the phone, but her sigh is clear; she returns to remove one head of broccoli from her basket. The white phone now hangs in her hand. She has moved to cosmetics. Her eyes amble over the face creams on display, looking without really looking. In her basket she has a box of oats, a carton of soy milk and the green vegetable. She seems unsure what to add next, moving briefly back towards the vegetable section before drifting in the opposite direction towards the frozen foods. For several minutes she stands in front of the garbage bags, squinting at the many choices. She decides on purple bags a shade or two darker than her shorts. She scuffs towards the self-checkout. Basket down now, she gazes at the screen a moment before moving to scan her first item. She has not brought her own bags. It was an interesting exercise. I ran into someone I knew at one point, and had to pretend I was doing some last minute shopping — even though I was at the opposite end of the supermarket to the milk and cheese, which is what I said I was there to get. And I discovered that stalking is really quite difficult. But the exercise was fun. I had trouble keeping to the word limit because I had many, many notes. Being asked to observe something almost always has me listening harder than I normally do, and I had lines and lines about the sound of the supermarket. As much as I dislike these places, supermarkets are fascinating. People behave strangely in them. This observation exercise was as much an exercise in trying to find the kind of compassion for other people I ranted about in my last post. People are rude and vague, tired and careless. Maybe they dislike the place as much as I do. In last week’s class we got back an edited version of our pieces and discussed the exercise. There were some fairly heated discussions about some of my classmates’ observations of other people. I won’t discuss those here just yet (they relate, again, to my last post and I want to give them a little more time when and if I do write about them). 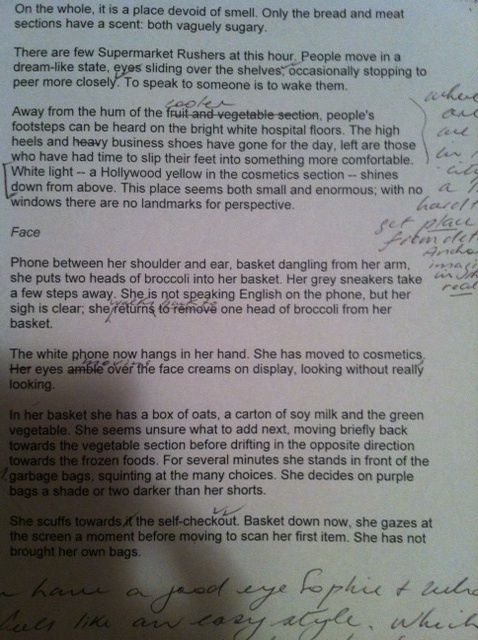 When I got mine back it was covered in notes, questions, underlines and crossings out. I love the way something looks when it’s been edited. I’m not really sure why. This entry was posted in Jottings, Outings, Uncategorized, writing and tagged observation, stalking, supermarkets, uni, writing by avocadoandlemon. Bookmark the permalink.